Endowed with magnificent scenery and unparalleled biodiversity, Cave Creek Canyon is truly a special place. It is in an area of rich biological diversity. Birding is fine here year-round and especially rewarding in the spring and summer. Many interesting birds from south of the border can be found here in the Chiricahua Mountains. Residents and visitors who want to help protect the area can do so by joining, volunteering, or contributing to the Friends of Cave Creek Canyon (FoCCC). 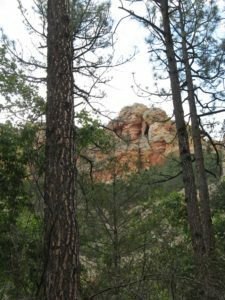 As individuals, families, and businesses, we work closely with US Forest Service professionals to support the agency’s work and mission in Southeastern Arizona. We seek to provide educational opportunities for area residents, visitors, school groups, scientific researchers, and others who cherish the special qualities of our region. Learn about FOCCC Events by clicking on the Events tab in the navigation bar. Reminders about upcoming events will be posted in this spot on the home page. The FOCCC Garden Party is scheduled for May 25, 2019, 9am - 1pm, at the Visitor Information Center! See photos of last year's activities in our June Newsletter and check out the Garden Party page under the Events tab in the navigation bar. Heritage Days 2019 - save the date for September 7 and 8! Check out information about last year's Heritages Days under the Events tab in the navigation bar. The FOCCC Annual Meeting, held on December 6, 2018, at the Geronimo Event Center, Rodeo, NM was a great success. Read about the great silent auction items in this Newsletter. Read our current newsletter, or browse our archive of past newsletters. Tom Arny, Bob and Bettina Arrigoni, Nancy and Thomas Denney, Bud and Kate Fackelman, Mary George, Renata Golden, Bill and Sally Hague, Paul Hirt and Linda Jakse, Pi Irwin & Zsombor Zoltan. Ken Jenkins, Leuthold Family Foundation, Barbara Lounsbery, Patrick McNamara, John and Karin McQuillan, Barbara and Pete Miller, Patricia Parran, CeCe Raak, Tom Roseman and Paula Baldwin, Delia Scholes, Donald and Martha Squire and Bob and Sherry Zoellick.